The Governor of Guam (Chamorro: I Maga’låhen/Maga’håga Guåhan ) is the chief executive of the Government of Guam and the commander-in-chief of the Guam National Guard, whose responsibilities also include making the annual State of the Island (formerly the State of the Territory) addresses to the Guam Legislature, submitting the budget, and ensuring that Guam’s public laws are enforced. The position was created in 1968, through the passage of the Guam Elected Governors Act which took effect in 1970. Guam elected its first civilian governor in 1970 with the inauguration of former governor Carlos Camacho. 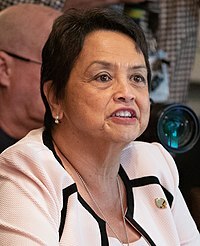 The current governor is Lou Leon Guerrero, a Democrat who was inaugurated on January 7, 2019 following her election in 2018. The governor has a duty to enforce Guam’s public laws, the power to either approve or veto bills passed by the Guam Legislature, to convene the legislature, and to commute or grant pardons to criminal sentences, except in cases of treason and impeachment. The governor is given the power to control government budgeting and appoint many officials (including many judges). Unlike the other government departments that compose the executive branch of government, the governor is themselves head of the state executive Department. The governor may also perform ceremonial roles, such as greeting dignitaries, issuing symbolic proclamations or commencing the Liberation Day parade. As the commander-in-chief of the Guam National Guard, the governor, as well as the president, may call on the Guard at a moment’s notice to provide defense for the island, in a state of emergency. The governor also delivers the annual State of the Island address (similar to the State of the State address in the US) to a special session of the Guam Legislature. The speech is given to satisfy a constitutional stipulation that a governor must report annually, or in older constitutions described as being “from time to time”, on the state or condition of the territory. Sitting along Route 1, the governor’s seat of power is located in Adelup in the Ricardo J. Bordallo Governor’s Complex, named after the island’s 2nd and 4th governor, Ricardo Bordallo. The governor resides in his/her official residence at the Government House in Agaña Heights. The island’s former Spanish and American military governors had resided in the Governor’s Palace in the Plaza de España (Hagåtña) till its destruction in the shelling of Hagåtña during the reconquest of Guam in World War II. has resided in Guam for five years, preceding the general election. According to the Elective Governor Acts of 1968, the Governor of Guam, together with the Lieutenant Governor, shall be elected by a majority of the votes cast by the people who are qualified to vote for the members of the Legislature of Guam. The Governor and Lieutenant Governor shall be chosen jointly, by the casting by each voter of a single vote applicable to both offices. The first election for Governor and Lieutenant Governor was held on November 3, 1970, with the election of Governor Carlos Camacho and Lt. Governor Kurt Moylan. Beginning in 1974, Guam’s Governor and Lieutenant Governor is elected by direct vote, on the first Tuesday of November. The Governor and Lieutenant Governor shall hold office for a term of four years and until their successors are elected and qualified. The Governor of Guam usually takes the oath of office on the first Monday of January. In past inaugurations, however, the governor-elect and lieutenant governor-elect would take the oath of office past midnight on Monday morning. Traditionally, the lieutenant governor-elect takes the oath first and delivers his inaugural remarks, followed then by the incoming governor-elect. As soon as the governor takes the oath of office, four ruffles and flourishes are played then followed by “The Stars and Stripes Forever” and a 21-gun salute. The newly inaugurated governor delivers his inaugural address, an opportunity for the new leader to state his goals for the next 4 years. I, (name), duly elected Governor of Guam, do solemnly swear, in the presence of the Almighty God, that I will well and faithfully support the Constitution of the United States, the laws of the United States applicable to Guam, and the laws of Guam, and that I will conscientiously and impartially discharge my duties as the Governor of Guam. In line with traditional oath-takings, governors have traditionally palmed a Bible and have added, “So help me God!” at the end of their oaths. The Governor of Guam is sworn in by the Chief Justice of Guam. The term of the elected Governor and Lieutenant Governor shall commence on the first Monday of January following the date of election. However, a former governor can be re-elected once again only after a full term has passed. During the Spanish colonial period, Guam was ruled from the Philippines as part of the Spanish East Indies by the Governor-General of the Philippines. As of January 2019[update], five former governors were alive, the oldest being Paul McDonald Calvo (1979–1983, born 1934). The most recent governor to die was Ricardo Bordallo (1975–1979, 1983–1987), on January 31, 1990. ^ “CSG Releases 2013 Governor Salaries”. The Council of State Governments. June 25, 2013. Retrieved November 23, 2014.